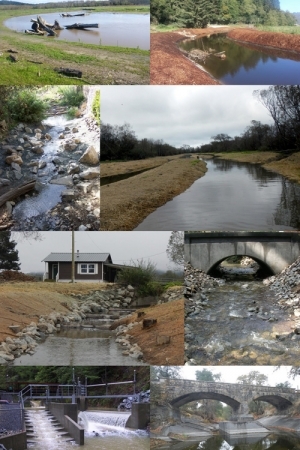 Michael Love & Associates, Inc. (MLA) specializes in engineering analysis and design to support watershed restoration and aquatic species management. Our staff multidisciplinary backgrounds are in civil and environmental engineering, hydrology, river hydraulics, fluvial geomorphology, sediment transport, and fisheries biology. MLA is experienced with taking projects from concept to completion. Our services include topographic and geomorphic mapping, developing complete engineering design plans and specifications, and providing construction management and inspection. MLA continues to take a leading role in the ongoing development and support of the U.S. Forest Service and U.S. Federal Highways funded FishXing software and associated online resources, and have developed fish passage and stream restoration design guidance documents for the US Forest Service and California Department of Fish and Wildlife. Our staff is recognized nationally and regularly serves as instructors and organizers for continuing education courses, workshops, and symposiums throughout the United States. We work extensively with both for-profit and non-profit organizations, and with numerous Federal, state and local agencies. MLA’s staff is highly experienced working with project proponents in securing grant funding for fish passage and aquatic habitat restoration and enhancement efforts.